Recorded history shows that the Siberian Cat breed has been around for at least one thousand years. They were first mentioned in Harrison Wier's book Our Cats and all About Them, which included information about one of the earliest cat shows held in England in 1871. However, finding written information in Russia is fairly difficult. Despite the fact that the Siberian cat is a natural breed and is the national cat of Russia, its very ubiquity makes it taken for granted rather than worthy of note in Russian literature. Add to this the vast expanse of Russia which encompasses 13 time zones as well as a multitude of ethnic and cultural diversity and you have a cat that seems as difficult to standardize as the country which gave rise to it. The Siberian cat was first imported in 1990. Despite it's popularity the Siberian cat is extremely rare in the United States. Most breeders have waiting lists for their kittens. The Siberian cat, considered a semi longhair, has a rich full coat in the winter while the summer allows for a somewhat shorter less dense coat. The Siberian cat can come in just about every color of the rainbow but because of the rarity of the breed those colors may not be available in your neighborhood. The Siberian cat was accepted for registration by CFA February 2000 and advanced to championship status in February 2006. The Siberian cat tends to be both a great problem solver and also, rather like dogs, are loyal to their adopted families which is why they are so well suited to the households in which one spouse, usually a husband or significant other, professes to be a "dog person" not a "cat person." Often it is that same "dog person" who is greeted at the door by their Siberian cat and after being dutifully followed around the house by their Siberian cat, then decides that one Siberian cat is simply not enough! Siberian cats are extremely agile and can leap great distances and heights to "fly through the air with the greatest of ease!" However, their agility also means they usually navigate potentially breakable brick-a-brac without leaving a path of destruction in their wake. Prudence dictates that one would still want to think twice about placing a Ming Dynasty vase on the mantle. A delightful combination of the flying Walenda's and the sleuth "the Pink Panther," the Siberian cat is a zany mixture of both. Expect the unexpected when sharing your home with a Siberian cat. 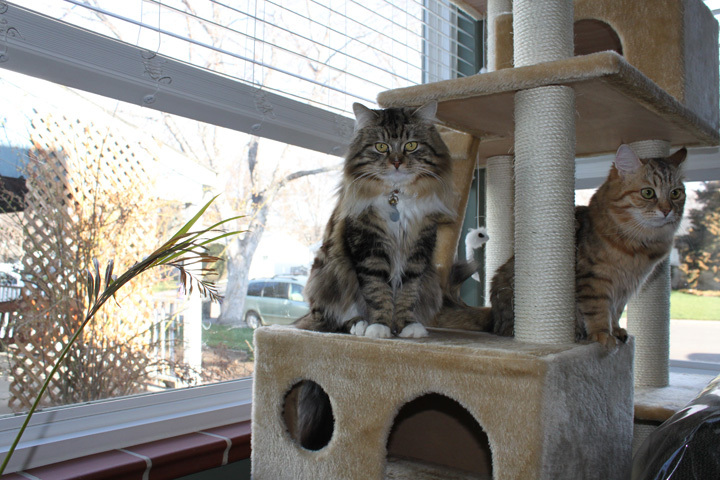 Pricing on Siberian cats usually depends on type, applicable markings and bloodlines distinguished by Grand Champion (GC), National, National Breed and/or Regional winning parentage (NW, BW, RW) or of Distinguished Merit parentage (DM). The DM title is achieved by the dam (mother) having produced five CFA grand champion/premier (alter) or DM offspring, or sire (father) having produced fifteen CFA grand champion/premier or DM offspring. Usually breeders make Siberian kittens available between twelve and sixteen weeks of age. After twelve weeks, Siberian kittens have had their basic inoculations and developed the physical and social stability needed for a new environment, showing, or being transported by air. Keeping such a rare treasure indoors, neutering or spaying and providing acceptable surfaces (e.g. scratching posts) for the natural behavior of scratching (CFA disapproves of declawing or tendonectomy surgery) are essential elements for maintaining a healthy, long and joyful life.